The Northern Rio Grande National Heritage Area, a 10,000-square-mile area of outdoor wonders and historic treasures encompassed within the boundaries of Santa Fe, Rio Arriba and Taos counties in north-central New Mexico, contains the centers of Pueblo and Spanish governance and settlement. The northern Rio Grande River flows through the center of the heritage area, but the area is strongly defined by its mountains, mesas, and high-desert terrain. Within its boundaries lie a variety of cultural and recreational resources, and it contains many of the National Historic Landmarks and parks included in this travel itinerary and a wealth of other historic destinations and experiences for visitors to the area wishing to connect with nature, culture, and history. In the broad Southwest, the States of California, Nevada, Utah, Colorado, Texas, and Arizona, which surround New Mexico, share the state’s developmental history as part of the Spanish Empire and Mexican territory. As it did with these territories, Mexico ceded New Mexico to the United States as part of the 1848 Treaty of Guadalupe Hidalgo. Interestingly, New Mexico (especially in the northern region surrounding the Rio Grande) contains the heart of Pueblo settlements, with some extending over the last millennium, and those of the earliest Spanish colonists, reaching back over four centuries. This association with centuries of settlement by different cultures, and the entrenchment of indigenous and Spanish languages and traditions, has framed people’s perceptions of New Mexico. Spanish exploration of the American Southwest began in 1539 with a scouting trip by Fray Marcos de Niza and his slave Estevan, entering north as far as the Zuni pueblo of Hawikuh. In 1540, Fray Marcos joined a large expedition of Spaniards led by Francisco Vásquez de Coronado, which ventured north from Mexico City in search of rumored Cibola and the cities of gold. Coronado did not find the legendary cities, but his party did make the first official contacts with the Pueblo peoples, venturing north as far as Taos Pueblo and beyond in an unsuccessful two-year trek. For about 50 years after this expedition, Spanish activity in the region was limited, but led to King Philip II of Spain awarding a contract to Juan de Oñate to colonize New Mexico. 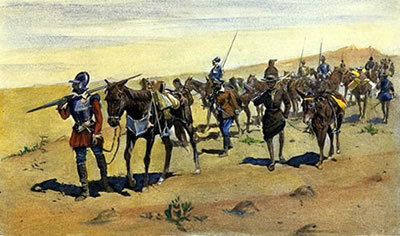 In January 1598, after three years of preparation, Governor Oñate led an enormous caravan of over 200 soldier-colonists, their families, nine Franciscan friars, several hundred indigenous Mexican Indian servants and allies, and thousands of head of livestock, north from central Mexico to colonize and settle the region north of the Rio del Norte (Rio Grande) and to spread Catholicism. Oñate built the first European capital of New Mexico and seat of the first European government of New Mexico at San Gabriel de Yunque-Ouinge, across the Rio Grande from the pueblo of Ohkay Owingeh. By 1610, the government moved to the new villa real of Santa Fe where the Spanish built the Palace of the Governors, today the oldest public building in the United States. Spain used the missionary system throughout the Americas to bring indigenous nations under the Spanish Empire through their conversion to Christianity. Catholic priests, often from the Franciscan and Jesuit orders, lived in remote locations to fulfill their mission of saving souls. The Spanish government supported the colonizing efforts of missionaries by providing them with material resources and soldiers. Throughout the region, the Pueblo neophytes used both European and indigenous tools to build mission infrastructure under the direction of the missionaries. 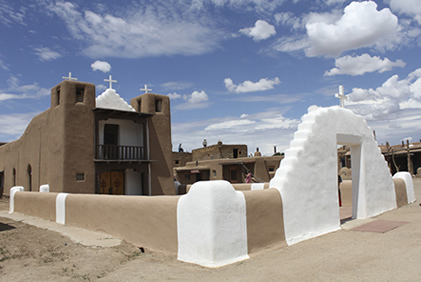 The Spanish and Pueblo constructed missions throughout New Mexico, and in the Heritage Area at places such as San Lazaro, Taos, and Santa Fe. The colonization of New Mexico was often tumultuous, as the Pueblo did not easily consent to submit to Spanish priests and soldiers. Large and small instances of resistance occurred throughout the 17th century culminating in the Pueblo Revolt of 1680. Though scattered across the region, the individual Pueblo villages worked together to launch a successful, highly coordinated rebellion to drive the Spanish from the New Mexico colony. The leader of the revolt, a man called Po’pay, organized the independent pueblos from the pueblo of Taos. In August of 1680, the Pueblo Indians at each Spanish mission village killed the priests and attacked nearby Spanish settlements. Pueblo Indians from the Acoma and Jémez missions joined in, as well, and the only church to survive the Pueblo assault was San Estevan del Rey in Acoma, which is not in the Heritage Area. The revolt culminated in an assault on Santa Fe, where the Pueblo Indians forced 2,500 Spanish colonists to flee the capital during the revolt. The survivors escaped south to El Paso del Norte, the southernmost settlement in the province. With the Spanish gone from the territory, the Pueblo destroyed missions and sought to return to their pre-Christian traditions and culture. Yet, they retained Spanish introductions of iron tools, sheep, cattle, and fruit trees in their daily existence. In 1692, the new Governor Don Diego de Vargas led a small army of 200 men out of El Paso to re-conquer the New Mexico territory. The Pueblos, who had moved into Santa Fe following the Spanish abandonment, surrendered peacefully to de Vargas at the city plaza after a short siege. 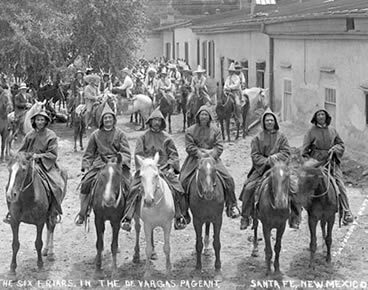 Returning a year later with new settlers, de Vargas confronted a new resistance in Santa Fe. The struggle for political, social, and cultural dominance in the region continued through the end of the century, with a final revolt in 1696. By end of the 17th century, Spain had reclaimed the Northern Rio Grande region with new settlements and missions. The lessons of the Pueblo Revolt led to significant changes in the governing efforts in the 18th century and to changed relationships between the Spanish and the Pueblos. Both realized the need to cooperate to defend themselves against the many raiding tribes. The Spanish abolished abusive Indian labor practices and instituted land grants, which included Indian groups, and helped to ensure that Pueblos retained their land base. Dozens of private land grants were distributed within the Heritage Area during the 1700s and early 1800s, with the most prominent being community grants made to groups who agreed to establish communal settlements and to cultivate the land. This led to expansion of communities and established farming and livestock ranching as principal occupations. Mission priests altered Catholic ceremonies to include some Pueblo spiritual traditions, and as an important part of the Reconquest, new parish churches and chapels were built in the Pueblo villages and dozens of communities that developed throughout the province as the frontier expanded and the population grew. The “crown jewels” of the churches in the Heritage Area were built during this period of expansion. The Santuario de Nuestra Señora de Guadalupe in Santa Fe, La Iglesia de Santa Cruz de la Cañada in Santa Cruz, San José de Gracia in Las Trampas, San Francisco de Asís in Ranchos de Taos, and El Santuario de Chimayó remain in active use. Life in the territory continued in relative isolation until Mexico won its independence from Spain in 1821, after 11 years of revolution. At the end of Mexico’s war with Spain, the newly independent Mexicans raised the Mexican flag above the Palace of the Governors in Santa Fe. The most important change from the break was loosening of trade and immigration between Mexico and the United States. Established in 1822, the Santa Fe Trail became an international trade route that stretched 1,200 miles between Santa Feand Independence, Missouri. Wagon caravans and lone traders traveled for 10 weeks, east and west, to bring goods across the continent. Trade also increased between Mexico’s New Mexico and California territories along the Old Spanish Trail, and between Mexico and New Mexico along El Camino Real de Tierra Adentro National Historic Trail. When the water was high on the Rio Grande, riverboats carried goods between New Mexico and the Gulf of Mexico. Trade with Santa Fe brought Americans to the Southwest, who brought Anglo culture and Protestantism to the largely Hispanic and Catholic province. The governance under Mexico lasted only twenty-five years. At the start of the Mexican-American War in 1846, the United States army under General Stephen W. Kearny took the capital. In August 1846, Kearny proclaimed from Santa Fe Plaza that the New Mexico territory belonged to the United States. The Americans immediately set up a temporary government headed by an Anglo Governor Bent and supported by a number of prominent New Mexicans. One of these men was Donaciano Vigil, who became the territory’s first Hispano-American governor after Bent was assassinated in January 1847. Vigil aligned with the Americans putting down New Mexican uprisings against the American occupation. He believed that the United States offered New Mexico a brighter future than did the Mexican government. The Mexican-American War ended with the Treaty of Guadalupe Hidalgo, signed in February1848. This treaty transferred nearly half of Mexico’s territory to the United States, including New Mexico territory. Now in an American territory, the Northern Rio Grande region’s Anglo population grew rapidly in the second half of the 19th century. As both settlers and the new American government altered New Mexican society, conflicts sparked between Hispanos and the newcomers over land rights. New Mexican farmers and ranchers lived on tracts of land granted to them or their families by the Spanish and Mexican governments generations earlier. Many New Mexicans and Pueblo Indians lived on communal farms and shared resources. When the Anglo Americans moved in, eager to start farms and ranches of their own, they often disregarded pre-war land settlements. If a portion of land was communal or owned by a single family for generations, there was often no clear owner of the land and Americans successfully challenged and won the right to resettle it. In response to this agricultural and social upheaval, New Mexicans applied for American homestead grants, some for the lands their families had lived on for hundreds of years. Many of these homesteaders were subsistence farmers, but others raised crops and livestock for profit. Spanish colonists introduced sheep to New Mexico in the 16th century, and since that era, wool has been an important New Mexican industry. 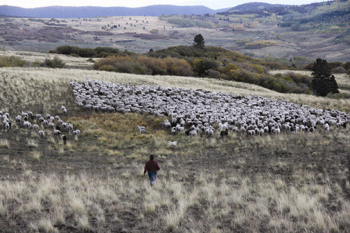 Sheep ranching flourished in northern New Mexico during the 19th century as new land opened up to settlers and the railroad made wool a major export. The crops they raised were a mix of European (lentils, melons, wheat, and fruit trees) and native (chilies and tobacco) plants, and they lived in single-story adobe buildings made of clay and straw bricks. Outside Santa Fe, El Rancho de las Golondrinas living history museum recreates traditional Hispano ranch life for visitors to experience. The United States admitted the territory of New Mexico as the 47th State in 1912. For 60 years leading up to statehood, the territory proved its loyalty to the Union and ability to contribute to the nation’s economy. During the Civil War, the Confederacy tried to take New Mexico but the New Mexico militia repelled it supporting Union troops at the 1862 Battle of Glorieta Pass. This battlefield is now part of Pecos National Historical Park. With the introduction of railroads in New Mexico, the land included in the Heritage Area exported timber, minerals, livestock, and ores. The railroads also facilitated influx of people to the region. By the time it received statehood, New Mexico’s population was more than five times larger than it had been in 1850. For all the changes wrought by centuries of human habitation and environmental change, the Northern Rio Grande National Heritage Area retains a recognizable feeling and identity. Older ways of making a living continue to hold meaning and value. Communities dating to the 13th and 14th centuries continue to be inhabited today, while archeological sites document human occupation in the region as far back as 12,000 years. Descendants of the Pueblo peoples retain much of their ancient lands, speak their native languages, and practice native religions. Likewise, descendants of Spanish explorers and conquistadores retain their cultural practices and language and a strong religious identity. In both communities cultural beliefs and living traditions are vividly expressed in the arts. The Heritage Area is a place where many cultures have interacted over a very long time in a manner unique to the Southwest. Traditional housing made of sun-dried adobe mud bricks, as introduced by the Spanish from Moorish traditions, now finds expression in expensive homes in Santa Fe and Taos and in more humble abodes in historic area communities. 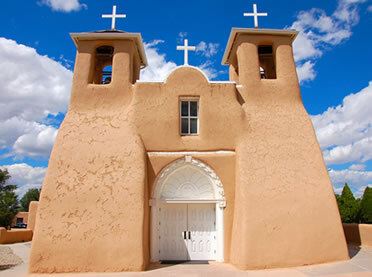 At the Ohkay Owingeh Pueblo’s San Gabriel archeological site, a Spanish mission church was built in 1598 – a generation before the Mayflower landed in Massachusetts; Santa Fe’s Palace of Governors is the nation’s oldest government building, dating to the founding of the City of Santa Fe in 1610. The enthusiasm of artists and of the local populace living daily lives reminds that the historic and cultural continuity of the region is its inheritance and also its gift to the world. What makes the Northern Rio Grande National Heritage Area unique is that so much of its past is still alive and vital. The life ways and relationships of ancestors continue to echo in lives being lived today. Motorists can tour the Northern Rio Grande National Heritage Area on scenic byways enjoying the landscape and stopping to visit the many historic places to see in communities such as Santa Fe, Taos, and Española. Many of the sites to see are included in this itinerary and featured in the National Park Service American Southwest Travel Itinerary and in the Places Reflecting America's Diverse Cultures: Explore their Stories in the National Park System Travel Itinerary. 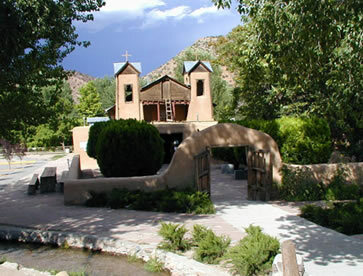 The communities in the Heritage Area have a wealth of museums and cultural centers that offer more information about New Mexico history, from the State History Museum and private museums in Santa Fe, the Plaza de Española and Misión Convento center in Española, located just south of Ohkay Owingeh Pueblo, to cultural entities in Taos. The Northern Rio Grande National Heritage Area works in partnership with the National Park Service, to bring together community, State, and tribal groups and organizations with a similar vision to preserve, celebrate, and support the region’s shared heritage. 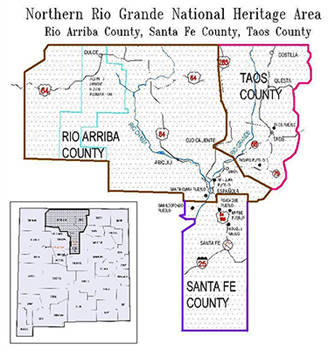 The Northern Rio Grande National Heritage Area is located in Santa Fe, Rio Arriba, and Taos counties in north-central NM. The Heritage Area stretches south to north from I-40 in the center of the State to the Colorado border. Area boundaries include all of Rio Arriba, Santa Fe and Taos counties. There is a Passport to your National Parks stamp station for the Northern Rio Grande National Heritage Area at Bandelier National Monument. For more information, visit the Northern Rio Grande National Heritage Area, Inc. website or call 505-753-0937. To learn more about the National Park Service National Heritage Areas program, visit this website. Many of the historic places to see in the Northern Rio Grande National Heritage Area are featured in the National Park Service American Southwest Travel Itinerary and in the Places Reflecting America's Diverse Cultures: Explore their Stories in the National Park System Travel Itinerary.